Not too long ago, I attended a media dinner at an Italian restaurant that served seriously horrendous food. The roasted eggplant tasted slightly rotten, while the spaghetti and meatballs were coated in a thick film of butter. The food was so inedible that that the public relations rep who was touting its merits didn’t even bother touching her entree. I walked away from that meal rethinking the value of press dinners and vowing to be much choosier from that point forward. After weeks without a single invitation worthy of honoring, an enticing offer from Yojie Japanese Fondue and Sake Bar arrived in my inbox. 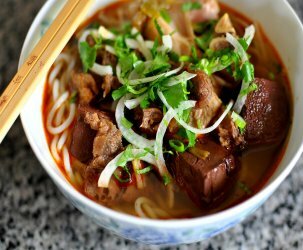 Charles Vu, one of Yojie’s owners, personally invited The Astronomer and me to come swish-swish at his brand new shabu-shabu joint downtown. While I’ve enjoyed many hot pots in my day, shabu-shabu is completely foreign to me. Since it’s not everyday that I’m able to experience something totally novel, I accepted Mr. Vu’s offer. 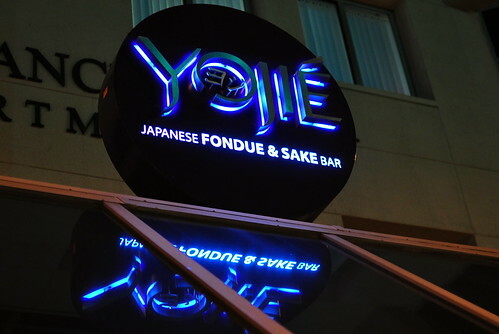 Located a few blocks from the Los Angeles Convention Center and the Staples Center, Yojie was full of hot pot-goers when we arrived at nine on a Friday night. Our booth was equipped with individually-controlled electric stove tops and two idle pots waiting to be filled. 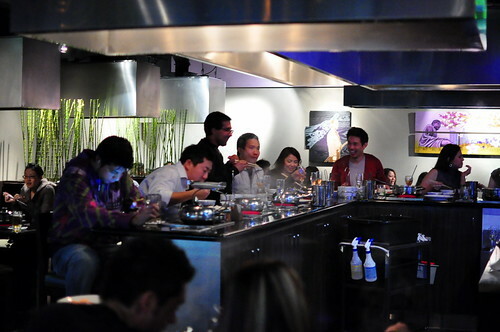 The concise menu focuses on shabu-shabu and sukiyaki, as well as a selection of sake and cocktails. 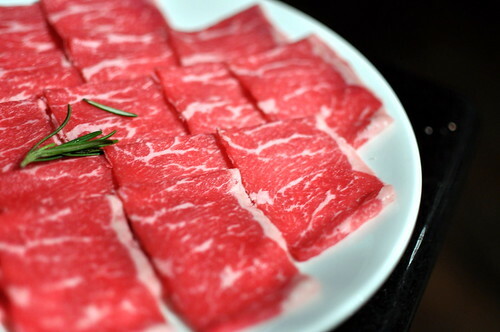 Both shabu-shabu and sukiyaki consist of cooking thin slices of meat by swishing it about in a communal pot of boiling broth. Whereas shabu-shabu’s broth is mildly savory, sukiyaki’s is distinctly sweet. Another difference between the two is how the protein is dressed once it’s cooked. 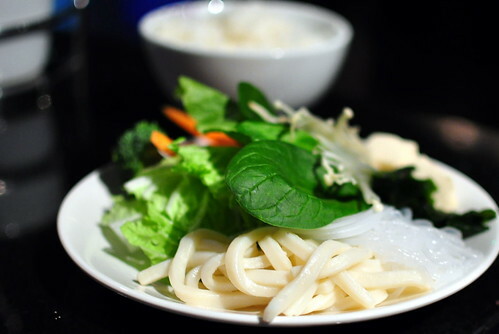 For shabu-shabu, the meat is dipped in ponzu or goma (sesame seed) sauce. For sukiyaki, it is dipped in raw egg. After indulging in a few shots of chilled nigori, The Astronomer and I placed our order for a pot of each of the house specialties. 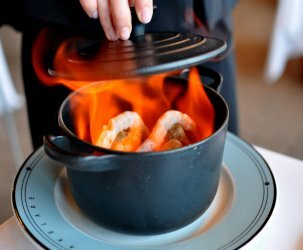 For proteins, we chose the Angus beef entrée, priced at $18 for eight ounces, and the Seafood Combination, priced at $20. Both entrees were served with vegetables, noodles, and steamed rice. 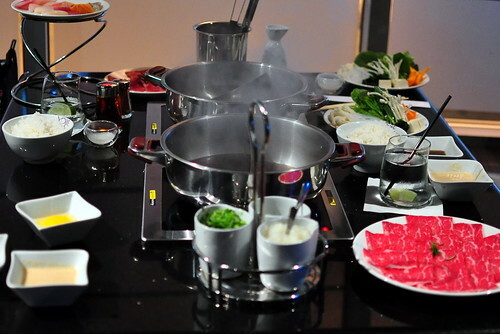 All of the necessary accompaniments for a complete shabu-shabu and sukiyaki experience were laid out at once. Although the seafood was excellent, the thin slices of beef were the highlight of the meal. The meat’s impressive marbling, coupled with my commitment to cooking it as little as possible, made for an extremely tender experience. I couldn’t get over how succulent it was. I preferred the soy- and sugar-laced sukiyaki broth for dipping, which was then followed by a quick dredging in raw egg. The Astronomer thought that the slick coating imparted a French toast-like quality to the meat. 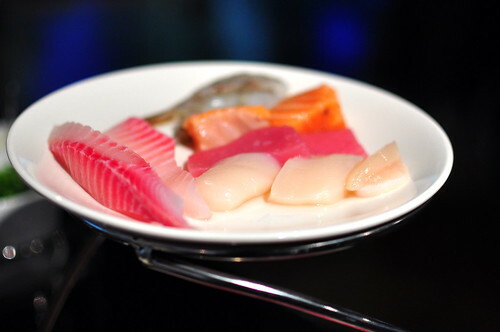 The scallops, talapia, shrimp, salmon, and tuna tasted great in both the shabu-shabu and sukiyaki broths. I felt like a rebel barely cooking the salmon and tuna. Fresh vegetables, udon and harusame noodles, tofu, mushrooms, and seaweed were also on hand for us to marry with the proteins. 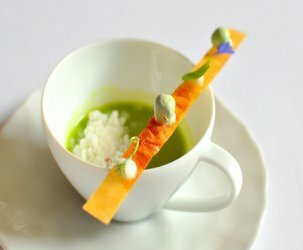 By the time The Astronomer and I had depleted our beef and fruits of the sea, we were completely satisfied. Although I’ve grown weary of free suppers in this town, I am glad that I took a chance on Yojie. Our swishy dinner was not only unique, but very delicious as well. I’ll definitely be back the next time I score tickets to the Lake Show. Sounds like being discerning makes a difference! Good pick, and great post! While nothing beats eating shabu shabu at my oba-san’s house, this sounds like a good spot! i can’t believe this is your first time shabu-shabu-ing. I love shabu been eating for around 5 years. I live DTLA so OF COURSE I’m gt try it out… I first had shabu shabu in Osaka Japan… and I have been hooked on it every since… i will let you all know how this place is AFTER i swiiish swiiish !!! Remember all of you first tiiime swiiishers… DONT overcook your meat.. and its ALL ABOUT THE SAUCE… ALL ABOUT THE SAUCE !!! That looks pretty worthy to me! Mmm haven’t had either shabu shabu or sukiyaki in ages, I can’t think of any restaurants up here that serves a decent version.